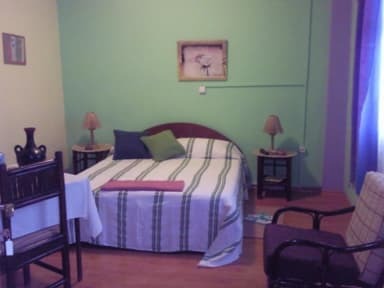 Family Cozy Bed and Breakfast i Addis Ababa, Etiopien: Reservér nu! There could be a reduction in numbers at times when something occurs but ,it&#39;s better they confirm with us ahead of time so, We( Family Cozy B&B) won&#39;t be able hassled. We shall also have a say or make other inquires to our dearest customers in letting them know 4weeks or before perhaps, if there needs in change of plans in our parts. I hope the guests ought to be adventures and We shall give all with our best to meet their ultimate demands with Full of hearts. Always be easily acceptance to changes. Outgoing and good sports. We welcome anyone with all ages, sizes and ethnics. Please don&#39;t be shy to ask any questions. We will be happy to assist you for further details. 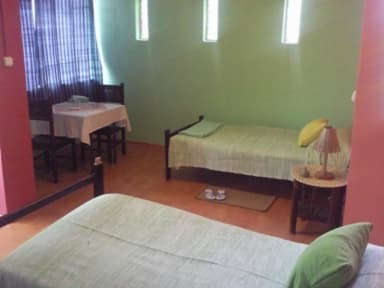 Family Cozy Bed and Breakfast offers clean and friendly accommodation close to the centre of Addis Ababa, within easy reach of restaurants and other amenities. We are just 10 minutes away from Addis Ababa Airport. We have 11 spacious and comfortable guest rooms. One room has its own en-suite bathroom while the others share five bathrooms between them, all spotless and with hot showers. Guests at Family Cozy Bed and Breakfast enjoy access to a well-equipped kitchen and a TV room. Also on the premises is the Family Restaurant, which serves a varied menu of international cuisine, including Mexican and European dishes. Italian, Lebanese and Ethiopian restaurants can all be found within walking distance. Services include laundry, internet access and transfers to and from the airport. We can also arrange reasonably priced tours of the city and day trips. Family Cozy Bed and Breakfast is dedicated to making guests feel at home. Please contact us to arrange check-in outside of these times. Breakfast and tax are included in the price. 9 to 12 person 5 usd each. 9 to 12 person 7 usd each.